This is the ninth Press Freedom Index (PFI) report since the annual series were launched in 2009 by Human Rights Network for Journalists-Uganda (HRNJ-Uganda). The PFIs provide a detailed account of violations committed against the media in the corresponding year, and highlight aspects of the legal, policy and regulatory frameworks that threaten freedom of expression and of the media, which are provided for in the Constitution of the Republic of Uganda and other regional and international instruments. The Press Freedom Index 2016 is the eighth successive annual summary of the state of media freedoms in Uganda. This edition summarizes the 135 violations and deplorable conduct of State agencies in 2016 documented and analysed by HRNJ-Uganda staff. The issues presented are tested against Uganda’s national, regional and international human rights obligations of which it is a party. Specific attention is given to those particular human rights instruments that protect media rights and freedom of expression. 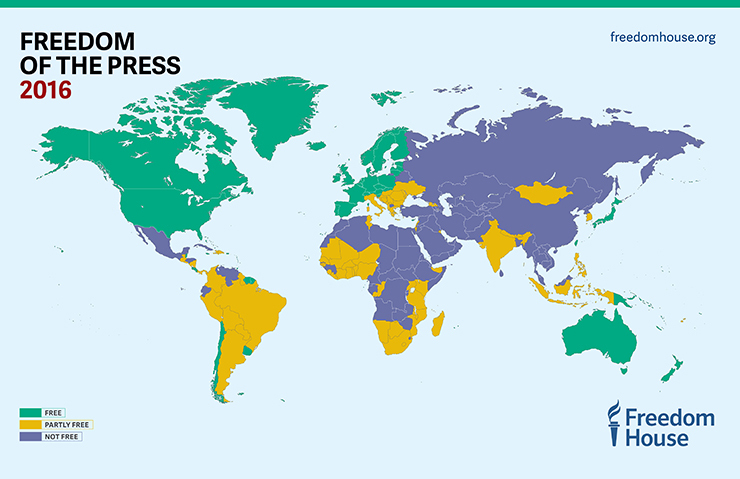 The Press Freedom Index 2015 is based on the 143 cases of attacks and abuse of journalist’s rights, local and international, documented and analyzed by Human Rights Network for Journalists-Uganda. It is built on the assessment of the abuses, the patterns they take and state and none actors involved. It is all encompassing; no distinction has been made in relation to journalists and other categories of people working with and contributing to media. HRNJ-Uganda has also paid attention to both public and private media. The reporting period between Dec.2014 and Nov.2015 was another challenging year for HRNJ-Uganda. There were persistent violation of journalists‟ rights and harassment. Journalists have been physically abused, shot, held incommunicado, tortured, had their gadgets destroyed, summarily terminated from work, endured hash bad conditions, intimidated and harassed. The legal regime has not been helpful either because most of the unfriendly media laws remain un amended and the operational context remains abysmal. This report is an assessment of the state of media rights and freedom in Uganda for the year 2014. It is based on information regarding threats and violations against freedom of expression received from different sources across the country and through our monitoring mechanisms. Our informants mainly contact us through the toll free line, emails and social media. This data is then investigated further, documented and subjected to analysis by HRNJ-U to establish its correctness and authenticity. Victims, witnesses and alleged perpetrators are then interviewed and where necessary, fact- finding missions are conducted. This report presents findings from a baseline survey of the situation of Uganda journalists’ safety, security and professionalism commissioned by the Human Rights Network for Journalist (HRNJ-Uganda) with financial support from the Democratic Governance Facility (DGF). The main objective of the survey was to establish the extent to which journalists understand and adhere to the different laws, policy frameworks and other professional codes that affect journalism and how these relate to their personal safety and security. The analysis discusses the limitations to media freedom in Uganda reflected in the various provisions of a wide range of laws. It notes that whereas not all laws mentioned herein are inimical to media freedom, most possess retrogressive provisions that are not in-tandem with Uganda’s international human rights obligations, are contrary to, and seek to water down the Constitutional guarantees on freedom of expression embedded in the Constitution of the Republic of Uganda, 1995. This report is an assessment of the state of media rights and freedom in Uganda for the year 2014. It is based on information regarding threats and violations against freedom of expression received from different sources across the country and through our monitoring mechanisms. Our informants mainly contact us through the toll free line, emails and social media. This data is then investigated further, documented and subjected to analysis by HRNJ-U to establish its correctness and authenticity. As the report documents, in the past three years, attacks on journalists have intensified and taken a new dimension in Uganda. The report considers the five fundamental questions that form basis of the debate on security and safety of journalists in Uganda. It seeks to establish what is the safety and security of journalists in light of the changing face of violations of freedoms of the media fraternity and who is perpetrating violations against journalists today. It further seeks to highlight the changing modes of violations today on journalists and situations under which they occur. This report tries to document the UPR process in Uganda and seeks to ascertain the level of implementation of freedom of expression recommendations three months after the adoption of the working group report. It lists actions that have so far been undertaken by the various state agencies in meeting their obligation to implement the said recommendations. The media industry in Uganda has faced various changes and developments. The media has developed from the initial religious dominated colonial media of colonial times, to the state dominated and control media of the early days of independence to a private sector dominated media of today, following the liberalisation of the sector in the early 1990s. As the sector continued growing, so was competition for the market space and the desire to capture wide coverage of distribution. Completion for dominance in the market share has come with a cost to professionalism, investment in research and training to the industry. This report highlights the suffering, insecurity and difficulties journalists face on a day-to-day basis while doing their journalistic work. It documents the events where journalists’ rights have been violated by state and non-state actors as well as exposing those who impede on media freedom. It shows consistent and constant attacks on journalists countrywide. The Press freedom Index Report 2011 covers a period of six months– it runs from November 2010 to April 2011. It is one of a series of reports HRNJ-Uganda has released since 2009. The reports focus on media freedom in Uganda with special emphasis on the rights of media practitioners as guaranteed under the constitution of Uganda, 1995 and regional and international human rights instruments ratified by Uganda.